When buying life insurance, most people don’t have a complete map. Without all the information to make the best decisions, many people make mistakes that lead to buyer’s remorse. But you don’t have to worry. Because you’re reading this, you can recognize and sidestep the common pitfalls people make in buying life insurance. Don’t end up frustrated, discouraged, unsatisfied, or without protection in your greatest hour of need. If so, what you buy won’t serve you the way you thought it would. Instead, you can make the best life insurance decisions by learning what not to do. What are the most common mistakes people make when buying life insurance? We’ll help you avoid the pitfalls and win at buying life insurance. With this information, you’ll get the protection that serves you the most. Then, you’ll have the greatest peace of mind and best accomplish your goals. Buying the right life insurance is important. But it’s just one small step in the greater journey of building time and money freedom. The first step is keeping more of the money you make. This includes tax planning, debt restructuring, cash flow awareness, and restructuring your savings. This step frees up and increases your cash flow, so you have more to invest. Then, you’ll protect your money with insurance and legal protection, and Privatized Banking. This second stage is where all aspects of insurance and Privatized Banking live. Here, you’ll create the right canopy of protection in your financial life. And, you’ll secure your ability to control your access to capital, by being your own banker. Finally, you’ll put your money to work and get it to make more. You’ll invest in cash-flowing assets to build time and money freedom and leave a rich legacy. As you are empowered to make the best life insurance decisions, you’ll move beyond analysis paralysis and make forward traction. Then, you’ll gain momentum on your journey to building time and money freedom. Many people get less than the maximum insurance they qualify for, leaving them underinsured. You wouldn’t want to insure your car or your house for only half its value. So why would you leave your most valuable asset only partly protected? You are the originator of all of your other assets, the producer of your life’s wealth. Insurance protection should start at the source. This widely common mistake stems from mainstream skepticism about insurance. Upon further investigation, these ideas come from one of the top three myths about insurance. However, the insurance company will not over-insure you. They carefully calculate your life in economic terms. This calculation measures your income and assets you’ve built to determine the wealth potential of your life, based on what you’ve produced up to this point. The maximum amount of death benefit you can qualify for is called your Human Life Value (HLV). Buying life insurance protects your income. Just like a home insurer wouldn’t insure a $100K home for $3 Million, the life insurer will not insure you for more than they believe you could produce during your lifetime. Insurance simply takes on the risk of filling up your wealth reservoirs to the level you would have, if you do not get the chance to actualize your production by living out your full life expectancy. With less life insurance than your HLV limit, you’re underinsured. If they lost you, family members would be left in a financial crisis, in addition to the grief they’d experience. When you buy your full HLV in life insurance, you give your family one of the greatest gifts possible. If something ever happened to you, they have the peace of mind that they would remain economically stable. This gives them space and time to mourn without having to jump into action to make ends meet. Another reason people stay tragically underinsured is that they believe life insurance’s job is just to cover the necessities. That’s because, when buying life insurance, most people start with tallying their needs. For instance, if there’s a remaining balance on the mortgage of $350,000, they’ll settle for $350,000 of life insurance, just so the spouse wouldn’t have to worry about making house payments. Even if you add in the typical needs analysis categories to account for college savings, paying off all loans, etc., you’re being forced to start from the basis of needs. This approach is inherently restrictive, as it’s the minimum required. However, life insurance is really about ensuring that what you want to happen in your absence will actually happen. Your family could continue on life as it was. Your spouse wouldn’t have to go back to work, downsize the house, take the kids out of private school, or abort the dream of building time and money freedom. And if you were planning a 40th birthday European vacation, a car for your daughter when she turns 16, or funding your grandchildren’s college, these wants will still happen without a hitch. If you’re underinsured, you may not have the chance to fix it later. Future health problems may arise, making you uninsurable, and preventing the opportunity to increase your protection. Don’t fall prey to these myths. Failure to recognize the value of life insurance is really an indication of the failure to recognize your own value. You are worth insuring fully, completely, and properly. We’ll chunk this one down into two different ways people end up getting the wrong kind of policy. First, if you buy term insurance only, it will be there for you just until the policy expires. According to industry data, only about 1 – 2% of term insurance policies pay out. Either the owner outlives the term, or the owner converts it to a permanent policy. If they outlive the term, they’ve paid into a policy all those years and received zero benefit in return. If they converted to a permanent policy, they later recognized the value of life insurance. One of the reasons that term insurance is so popular is that it’s usually lower cost than a permanent policy. Today anyway. We’ll address this further in mistake #3. Another common belief is that you won’t have a “need” for life insurance after you retire. This misnomer stems from the belief that you will have accumulated enough assets to be self-insured. Supposedly, you will have all your liabilities paid off, kids will be adults, and your spouse won’t need income, since they’ll have Social Security, maybe a pension, and retirement accounts that will give them a comfortable standard of living. But because of typical financial planning this vision isn’t becoming a reality for most people. Even if it was, we see an increase in the desire to own life insurance as people age. Some of the reasons include a desire to leave a legacy and take care of loved ones. Life insurance is a when product, not for the if or just in case. The only time you really want it is the moment before you exit the planet. Since we can’t predict with any degree of accuracy when that will be, the wisest step is to ensure it will be there at that moment. Then, you’ll have the greatest peace of mind. You do this by having a permanent policy that covers you for your whole life. Secondly, many popular permanent policies like universal, variable universal, and variable life insurance solve one problem but create another. They are classified as permanent policies because they cover you for the full course of your life. You solve the problem of an expiring term because you get the peace of mind that the policy will pay out, whenever you die. However, these policies are built on annually renewable term insurance, which has an increased cost of insurance each year. If the cash value growth isn’t sufficient to make the premium payments in the later years, you could end up with no cash value and an ever-increasing premium. We’ve seen too many of these types of policies require more premium due than illustrated when the insured reaches their 70s and 80s. This leads to families who might be funding care of elder parents and counting on the life insurance benefit as reimbursement, being left in a lurch. They have to scrape up extra money to find a way to keep the policy in force or risk having to surrender the policy because they couldn’t afford the ever-increasing premiums. Saving money is a noble, worthy objective. But going cheap and cutting costs on important things today ends up costing you more in the long run. Try “saving money” by living on a diet of top ramen. You’ll soon realize that your health bills cost way more than buying wholesome veggies and protein. It’s the same with buying insurance. If you’re buying life insurance when you’re young and in excellent health, term insurance is usually the cheapest option. Today. The problem is that by using a term only approach throughout your whole life to “save money,” you may actually spend the most. Additionally, with the term only strategy, you wouldn’t have access to cash value during your lifetime. This limits the good your policy can do for you. Another way “saving money” with insurance comes back to hurt you is when you buy less insurance to lower the cost. But this leaves you underinsured. Again, to “save money,” you may cancel a policy or choose not to renew it, leaving you without coverage when you need it most. If you want to save money on insurance, use our 7 tips to make sure you’re doing it in a way you won’t regret later. Life insurance is a multi-faceted tool. Focusing only on the death benefit could be called buying “death insurance.” Even if you’re maximizing your human life value, “death insurance” is about as morbid as it sounds because it doesn’t do anything for you while you’re living. To get your life insurance to enhance your life during your lifetime, you want to have cash value that you can use. This gives you control of a pool of growing, liquid, accessible capital that won’t vanish if the stock market falls. That means that you can build a reserve for emergencies and opportunities, giving you peace of mind and financial stability if your income dried up, an unexpected expense arose, or when you want cash ready to deploy in a perfect investment. If you focus on death benefit only, you’ll miss the opportunity to get your money doing the most for you. To gain the greatest control, longevity, guarantees, and death benefit, we almost exclusively use a combination of term and whole life insurance. Group insurance is a benefit many employers offer to their employees. It’s part of providing a competitive compensation package to attract and retain quality talent. Group life insurance is attractive because it’s simple, quick, and easy. It’s low cost because it’s collectively bargained. It’s easy to set it and forget it because it comes out of your monthly paycheck. There’s very little barrier to entry because it’s usually guaranteed issue, meaning you can still get covered, even if you aren’t healthy. You can also usually add coverage for a spouse, and sometimes even your kids. However, the employee who relies on group life insurance is putting a Band-Aid on something that needs stitches. Here’s why relying on group coverage is a mistake. Most group policies are not portable. If you leave your employer, whether by choice or not, you often can’t take your coverage with you. If you do have the option to continue the policy, you’d move from the group cost to an individual cost as a one-year renewable policy, at your current age. This means you can expect a huge cost jump. While group coverage is an easy first step into life insurance, it shouldn’t suffice to check life insurance off your to-do list. Use group coverage as a supplement, but not as your primary life insurance coverage. 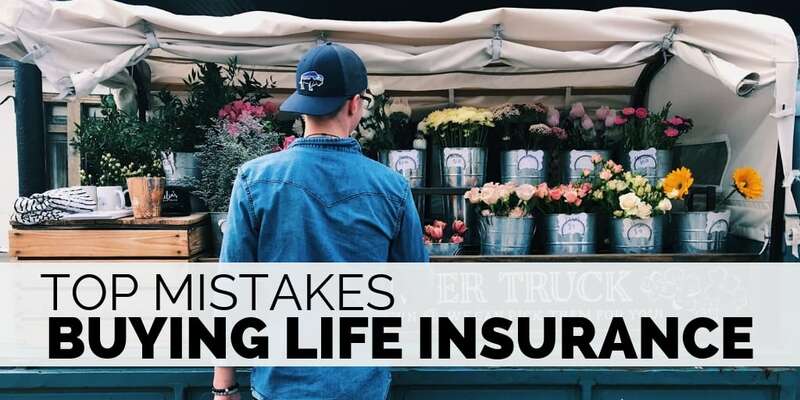 One of the biggest mistakes in buying life insurance is settling for the wrong product design because it won’t do what you expect it to do for you. You need to have a candid dialogue with your life insurance agent that includes knowing your purpose for buying life insurance and what you’re trying to accomplish. Then, the policy needs to be designed to best suit those objectives. 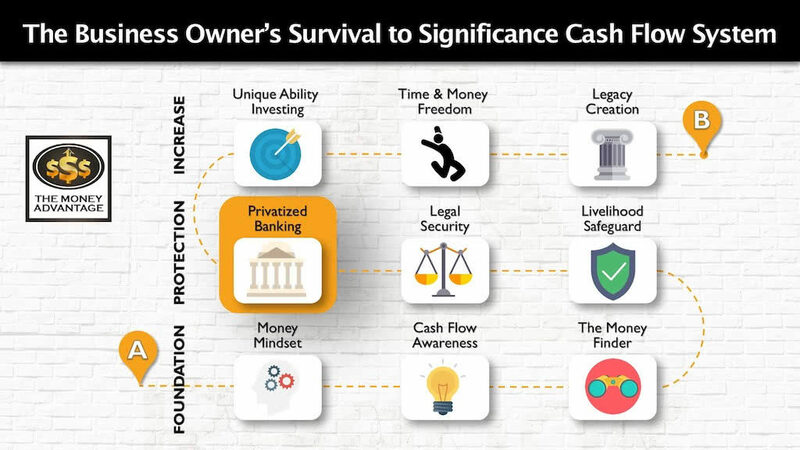 If you want to implement Privatized Banking with high cash value life insurance to be able to use your cash early, make sure you’re working with an agency that’s familiar with that strategy. Ideally, Privatized Banking policies should have at least 50 – 60% of your premium dollars available in cash value in year 1, right after your check clears. Then, you can access your cash with a policy loan right away. While most life insurance agents are well-intentioned, they’re often more familiar with designing policies for long-term cash accumulation, not policies that are meant to be used. These objectives aren’t wrong, but make sure your policy will work for what you intend. Another major mistake people make when buying life insurance, is working with a specific company just because it’s convenient. Maybe your brother, uncle, or best friend is in the industry, and you end up buying a policy with a particular company just because that’s the one they recommend. Or you chose who to work with because it’s a big company with a lot of apparent clout. That being said, insurance companies rarely go out of business. As an industry, they maintain high standards and a strong reputation. However, rather than choosing on the basis of convenience, you want to work with the best life insurance companies. Your minimum criteria should be a mutual company that has A ratings or better, a Comdex score of 80+, and a 100+ year history of paying dividends. It probably comes with no surprise to you that not all life insurance is designed alike. Not only are there many carriers and companies to work with, but each also has multiple product types and policy features. Then, many add-ons can improve the versatility and performance of your policy. Here are a few key riders you want to make sure you include in your policy. Some have an additional charge, and some are included as amendments to the original policy without an added cost. Overlooking these riders, either because you didn’t know to ask for them or your life insurance agent didn’t inform you can lead to later regrets and lack of versatility. A Paid-Up Additions rider (PUA) enhances a whole life insurance policy. This is a key policy design feature that allows for maximum cash value accumulation. The Waiver of Premium rider provides for the life insurance company to pay your policy premiums if you lose your income due to disability. This allows your policy to remain in force, even if you can’t continue funding it in that circumstance. An Accelerated Death Benefit rider allows a portion of the death benefit to be fronted to the policyholder if they are diagnosed with a terminal illness. Also called a Terminal Illness rider or referred to as a bucket list rider, this allows you to use the policy however you want to, whether to enjoy life to the fullest, go on vacation, etc. if confronted with that reality. A similar rider is the Long-Term Care rider, or Chronic Illness rider, accelerates the death benefit to you in the event of the failure to perform some of the activities of daily living. The funding can then be used to fund long-term care expenses or pay for other medical costs. A convertibility rider is critical to have on any term policies. This rider gives you the option to convert to a permanent policy at any time during the term, using your original underwriting status. You’re essentially “locking in” your health rating for the future, so you won’t have to pass underwriting again when you convert. Your rates for the new, converted policy will be based on your age at the time of conversion. The primary advantage of having these riders on your life insurance policy is that you now own a master key that can be used no matter how life turns out in the future. Rather than paying for expensive individual products that do only one thing, life insurance can be your Swiss army knife that can handle just about anything. You aren’t stuck with having paid for something you may never get to use. This gives you the greatest peace of mind that you’ll be able to handle whatever circumstances you face. One of the biggest mistakes in buying life insurance is being afraid to make a mistake. Perfectionism is best friends with procrastination. Deciding not to decide, then, is having decided. If you over-analyze, you’ll run the risk of making the greatest mistake in buying life insurance, which is …. Hand-in-hand with over-analyzing, if your decision-making process prevents you from moving forward and buying life insurance, you’ll have the greatest mistake of all on your hands. While it’s a mistake with dire consequences, it’s the #1 most common mistake in buying life insurance. There’s not a client we meet that doesn’t say, I wish I started this sooner! The sooner you buy life insurance, the lower your lifetime premiums will be, the better ratings you’ll secure, and the more likely you are to be able to be insured. Also, if you’re starting with a whole life policy, the earlier you start, the more cash value and death benefit you’ll build up over time because you’re getting the policy to work for longer. Possibly the worst consequence of delaying a life insurance purchase is that it could mean that you lose the opportunity to buy it at all. No age is too old to buy life insurance. In fact, we have written well-performing policies on clients even in their 70s. However, as we age, health concerns often increase, limiting or preventing insurability. If you find yourself in a situation where your health makes life insurance unproductive for you, there is redemption. To obtain the benefits of control, access to cash value, and the ability to transfer your legacy, you could buy whole life insurance on a spouse, child, grandchild, or a parent. 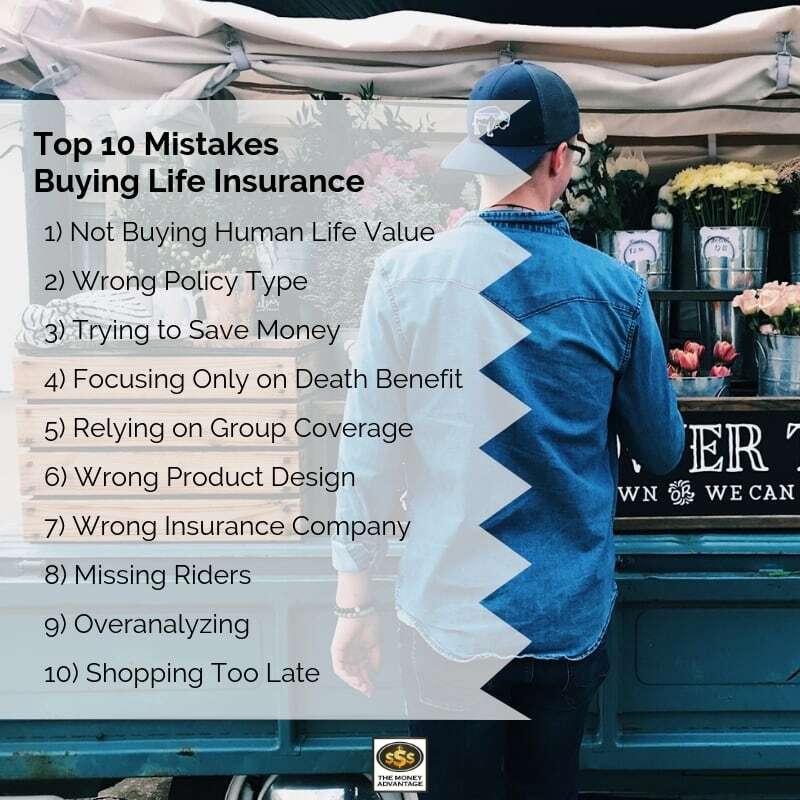 Today, we’ve covered the top 10 mistakes we see people making when they buy life insurance. Our purpose is not to scare you or make you afraid of making mistakes. Rather, getting a bird’s eye view on what everyone else is doing wrong will help you make winning decisions. Instead of making life insurance decisions you’ll regret later, recognize the mistakes, so you don’t make them. Use these 10 common mistakes to help you avoid the pitfalls and mental shortcuts that leave you vulnerable, unprotected, and dissatisfied with your purchase in the years to come. If you’ve made some of these mistakes in the past, don’t beat yourself up over it. Don’t let past mistakes prevent you from making the best decisions today. You’ll never make perfect decisions. You’ll only make the best decision you can with the information available to you. We hope that you now have a lot more information and clarity to make great decisions. Move forward today, make the best decision with the information you have, and your future self with be forever grateful. In the future, you can always add on to your strategy, continually improving as you go. 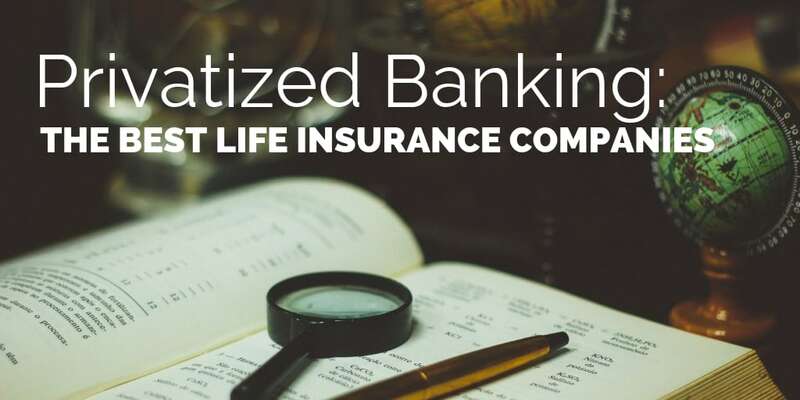 For more information on Specially Designed Life Insurance Contracts, get our free 20-minute guide: Privatized Banking – The Unfair Advantage. For help determining the right life insurance strategy for you, book a call with our advisor team today. We’ll also help you discover the one thing you should be doing today to optimize your personal economy and accelerate time and money freedom.